This is a trend that is coming to your local trendy café. So why not jump on the bandwagon and do them yourself. These can then be created and stored in the fridge ready for when they need to be brought out onto the table. The best thing is they don’t need to be baked. No Bake Cheesecake in a Glass Jar. This is only a guide so you can change a few simple things around and create multiple deserts in one go. Crush the biscuits and then melt 3 tablespoons of butter. Mix biscuits and butter until they are combined. Add more butter if needed. Distribute evenly across your dessert jars, and push down flat before putting them into the fridge. Spread this mixture across all the jars and then put it back into the fridge. To finish put some nice whipped cream on the top and then choose your fruits and put present nicely for that special dinner. 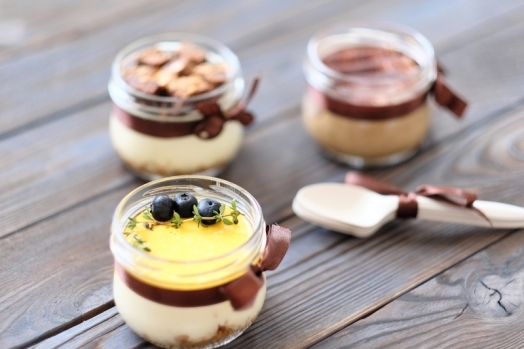 Presenting your cheesecakes - Choose the Right Dessert Glass Jar. Make sure you choose the right jar, For these kind of cheesecakes I would choose a jar with a wide mouth like our 300ml General Purpose Glass Jar or if you want to make a smaller jar why not our 250ml round jar this will then give you a nice portioned cheesecake either for your restaurant / Café or for that dinner party. A helpful hint is make sure you use fruits with bright colours to make it yet even more striking.